Story Blurb: Grieving over the death of his lover, British flying ace Bat Bryant accidentally kills the man threatening him with exposure. Unfortunately there’s a witness: the big, rough American they call “Cowboy” – and Cowboy has his own price for silence. 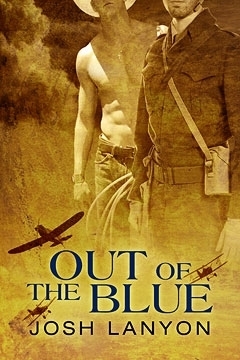 In preparation for Remembrance Day–for which I have a non-fiction book picked–I came across Out of the Blue [Just Joshin Publisher, 2012] by Josh Lanyon. It’s a name I’d heard of before, but had never stopped to read any of his works. Nevertheless, I’m glad I did. The tale is set at an allied air base in France during WWI. Captain Bat Bryant is a British flying ace with an Eton College background, and as the story opens he is being confronted by a potential blackmailer. During the course of this confrontation Bryant strikes and accidentally kills the extortionist, and is witnessed by an American flying ace named “Cowboy.” Cowboy then reveals that he also knows of Bryant’s brief affair with Lieutenant “Owl” Roberts, but inexplicably offers to dispose of the body just the same. Bryant accepts his offer, and the stage is then set for the bulk of the story involving the relationship with the exploitative American. At 193 KB this ranks as a short story, which I tend to like because of their distillation of events. Author Lanyon appears to understand this appeal as well, for he has staunchly adhered to the three basic rules; i.e. get in, tell the story, and get out. There is no dallying here. The prose is spare but efficient, the characters tend to develop as they go along (mostly relying on dialogue for their personalities), and the era and setting get a just-enough amount of description. Having said that, there is very little missed. Cowboy is a ‘cowboy,’ and Bryant is his willing ‘mount,’ yet there is a genuine affection as well. The era is effectively evoked by touches like the lyrics to “Roses of Picardy”—an iconic song of WWI—and the “dogfights” are some of the best I’ve read. My only quibble with Out of the Blue is that some (a few) of the events tend to come out of blue as well, and as such I was ‘quizzical’ regarding the motivations. Nonetheless, this is a bang-up story that gets my enthusiastic recommendation. Four and one-half bees. Just received notice of the Goodreads Choice Awards 2012. I WON’T be taking part. For one thing, it is only open to “Books published for the first time in the United States,” (nothing about Canada), and of the 15 categories, not one of them is for GBLT books–fiction or non-fiction. So best of luck, but no thanks. Thanks for dropping by. I hope that all my friends living on the east coast of United States and eastern Canada will be safe from Sandy’s wrath. My thoughts are with you.